نظرپور, محمدتقی, سعادتی وقار, پوریا, حیدری, احمد. (1396). بهبود کالبد سکونتگاه‌های دانشجویی در جهت افزایش اجتماع‌پذیری با تکیه بر روش نحو فضا، نمونه‌موردی: خوابگاه دانشگاه حکیم سبزواری، سبزوار. معماری و شهرسازی آرمان شهر, 10(21), 247-265. محمدتقی نظرپور; پوریا سعادتی وقار; احمد حیدری. "بهبود کالبد سکونتگاه‌های دانشجویی در جهت افزایش اجتماع‌پذیری با تکیه بر روش نحو فضا، نمونه‌موردی: خوابگاه دانشگاه حکیم سبزواری، سبزوار". معماری و شهرسازی آرمان شهر, 10, 21, 1396, 247-265. نظرپور, محمدتقی, سعادتی وقار, پوریا, حیدری, احمد. (1396). 'بهبود کالبد سکونتگاه‌های دانشجویی در جهت افزایش اجتماع‌پذیری با تکیه بر روش نحو فضا، نمونه‌موردی: خوابگاه دانشگاه حکیم سبزواری، سبزوار', معماری و شهرسازی آرمان شهر, 10(21), pp. 247-265. نظرپور, محمدتقی, سعادتی وقار, پوریا, حیدری, احمد. بهبود کالبد سکونتگاه‌های دانشجویی در جهت افزایش اجتماع‌پذیری با تکیه بر روش نحو فضا، نمونه‌موردی: خوابگاه دانشگاه حکیم سبزواری، سبزوار. معماری و شهرسازی آرمان شهر, 1396; 10(21): 247-265. 1استادیار معماری، دانشکده معماری و شهرسازی، دانشگاه شهید بهشتی، تهران، ایران. 2دانشجوی کارشناسی ارشد، دانشکده هنر و معماری، دانشگاه بوعلی سینا، همدان، ایران. 3دانشجوی کارشناسی ارشد، دانشکده معماری و شهرسازی، دانشگاه شهید بهشتی، تهران، ایران. در طراحی فضاهای خوابگاهی اجتماع‌پذیر عوامل کالبدی، کارکردی و ویژگی‌های اجتماعی- روانی کاربران فضا نقش دارند. پژوهش حاضر با تمرکز بر اصلاح کالبد از طریق نحو فضا و ارتقاء عوامل کالبدی و بهبود فاکتورهایی نظیر راه‌یابی، جهت‌گیری، دید مورد نیاز کاربر و خوانایی فضا، درصدد ارائه راهکارهایی به‌منظور ایجاد سکونتگاه‌های دانشجویی اجتماع‌پذیرتر می‌باشد. به‌همین منظور دو مورد از خوابگاه‌های دانشگاه حکیم سبزواری سبزوار که از چیدمان خطی و حیاط مرکزی برخوردارند، با فرض بر این که پیکره‌بندی کالبدی- فضایی مناسب خوابگاه دانشجویی نقش به‌سزایی در ارتقاء اجتماع‌پذیری این اماکن دارد، مورد کنکاش قرار گرفتند. با استناد به پیشینه تجربی موجود، پیکره‌بندی فضایی از طریق سه شاخص اتصال، هم‌پیوندی،عمق فضا و شاخص ترکیبی خوانایی در قالب سه رویکرد محوری، محدب و میدان دید مورد سنجش قرار گرفت، به‌علاوه رویکرد عامل اساس در روش چیدمان فضا به‌عنوان رویکردی کمکی به‌منظور جامعیت بیشتر به نتایج پژوهش به‌کار رفت. شاخص‌های نام‌برده، در راستای نظریه حرکت طبیعی، روش چیدمان فضا (تحلیل روابط بین فضاها) را به الگوهای رفتاری و اجتماعی کاربران ربط می‌دهد که نشان از فصل مشترک هر دو مقوله اجتماع‌پذیری و پیکره‌بندی فضایی می باشد، همان طور که در پیشینه تجربی موجود نیز از این روش و نظریه به‌منظور پیش‌بینی و تحلیل رفتارهای اجتماعی کاربران بهره گرفته شده است. در واقع رویکرد پژوهش حاضر، شناسایی کم هزینه‌ترین اقدامات کالبدی- فضایی مؤثر بر اجتماع پذیری در خوابگاه‌های دانشجویی، پیش از هر اقدام عملی و سرمایه‌گذاری می باشد. Benedikt, M. L. (1979). To Take Hold of Space: Isovists and Isovist Fields. Environment and Planning B: Urban Analytics and City Science, 6(1), 47-65.
Cooper Marcus, C., Francis C. (1998). People Places: Design Guidelines for Urban Open Space. Second Edition. New York: Van Nostrand Reinhold. Dawson, P. C. (2003, June). Analysing the Effects of Spatial Configuration on Human Movement and Social Interaction in Canadian Arctic Communities. In 4th International Space Syntax Symposium, 1, 1-37. Formal Classification & Spatial Configuration in Vernacular Housing: A Comparative Study on the Zoning of the Reception Area in Traditional Houses of Kerman Province, Journal of Housing and Rural Environment, 31(138), 3-16. Hall, E. T. (1982). The Hidden Dimension, New York: Anchor Books, Doubleday. Hillier, B. (1988). Against Enclosure. In: Teymus, N., Markus, T., Woaley, T. (Eds. ), Rehumanising Housing. Butterworths, London, 63–85. Hillier, B., Penn, A., Hanson, J., Grajews Ki, T., & Xu, J. (1993). Natural Movement: or، Configuration and Attraction in Urban Pedestrian Movement. Environment and Planning B: Planning and Design, 20(1), 29-66. Hillier, B. (1999). The Hidden Geometry of Deformed Grids: or, Why Space Syntax Work, When It Looks as Though It Shouldn’t. Environment and Planning B: Planning and Design, 26, 169-191. Hillie, B., L. Vaughan (2007). The City as One Thing. Progress in Planning, 67(3). Hillie, B., Richard Burdett, John Peponis and Alan Penn. (1987). Creating Life: Or, Dose Architecture Determine Anything?, Arch & Compart/Arch Behav, 3(3), 233-250. Jafari Bahman, M. A. & Khanian, M. (2013). 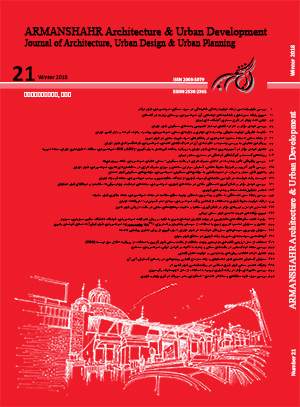 Comparative Study of the Existing Condition of Kababian Neighborhood with the 2005 Comprehensive Development Plan of City Of Hamadan Using Spacesyntax Software, ARMANSHAHR Architecture &Urban Development Journal, 9, 299-289 (In Persian). Jiang, B., Claramunt, C., & Klarqvist, B. (2000). An Integration of Space Syntax into GIS for Modelling Urban Spaces. International Journal of Applied Earth Observation and Geoinformation, 2, 71-161. Kamlipur, H., Memarian, Gh. H., Feizi, M., & Mousavian, M. F. (2012). Formal Classification & Spatial Configuration in Vernacular Housing: A Comparative Study on the Zoning of the Reception Area in Traditional Houses of Kerman Province, Urban and Rural Environment, 138, 3-16. Klarqvist, B. (1993). A Space Syntax Glossary. NORDISK ARKITEKTURFORSKNING 2. Lynch, K. (1960). The Image of the City, MIT Press, Cambridge, MA. Mardomi, K., Ghamari, H. (2011). Architectural Requirements for Improvement of Sociopetaloid Spaces in Metro Stations Spaces, Urban Management, 27. Mokhtarzadeh, S., Abasszadegan, M. & Rismanchian, O. (2012). Analysis of the Relation between Spatial Structure and the Sustainable Development Level. A Case Study from Mashhad/Iran. Eighth International Space Syntax Symposium, Santiago. Montello, D. R. (2007) The Contribution of Space Syntax to a Comprehensive Theory of Environmental Psychology, Proceedings, 6 Th International Space Syntax Symposium, İstanbul, 2007, Iv01-Iv12. Önde, D. E., Gigi, Y. (2010). Reading Urban Spaces by the Space-Syntax Method: A Proposal for the South Haliç Region, Cities, 27, 260-271. Rismanchian, O. & Simon, B. (2011). A Study over Spatial Segregation of Deprived Areas in Spatial Structure of Tehran by Using Space Syntax Technique, Bagh E- NAZAR, 17, 69-80 (In Persian). Sennett, R. (1974). The Fall of Public Man, New York, ww Nrton & Company. Steadman, P. (1983). Architectural Morphology. London, Pion. Tahersima, S., Irani Behbahani, H. & Bazrafkan, K. (2015). Determining of Educational Role of Iranian School Open Spaces– Regarding the Comparative Investigation on Traditional Vs Contemporary School (Case Studies: Chaharbagh, Darlolfonoun and Alborz Schools), Journal of Reasearch in Islamic Architecture, 6. Tandy, C.R.V. (1967). The Isovist Method of Landscape Survey. (Murray, A.C., Ed. ), Methods of Landscape Analysis, Vol. October, Landscape Research Group, London, 9-10. Van Nes, A. (2012). The One- and Two-Dimensional Isovist Analyses in Space Syntax. (S. Nijhuis, R. Van Lammeren, F. Van Der Hoeven, Eds. ), Exploring The Visual Landscape; Advances In Physiognomic Landscape Research In The Netherlands. Iospress, Amsterdam, Pp. 163–184, <Http://Dx.Doi.Org/10.4233/Uuid:Fe6698ae-045c-436b-945b-C61c4b0437e4>. Whyte, W. (1980) Social Life of Small Urban Space: Conservation Foundation. Washing-Ton DC. Published By Project for Public Spaces In 2001.